There was a lot of the same scratchy mystery yarn as the other time I went to the show, but this time there was linen, too. The cylinders are smallish (not as big as a standard cheese of Borgs cottolin), and heavy on the pink, but I scooped up almost everything that was there. Those tags? Most of them say 50 cents, 75 cents, and $1! To be honest, I was greedy. I only left a couple of particularly pepto pinks, some stained stuff, and maybe a few that smelled. 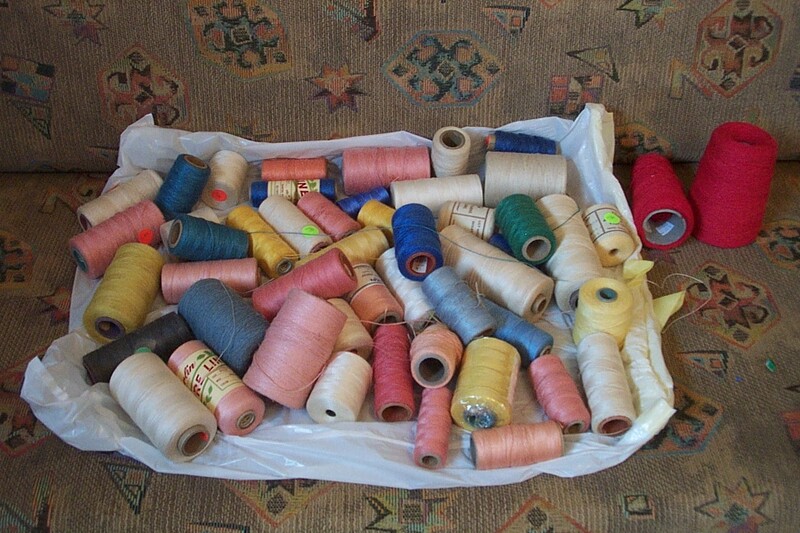 But one of the weavers mentioned that there was a lot more yarn earlier in the day. Does it make it any better that I was only feeding on the crumbs of a greater greed than my own? I justify my purchase by the fact that when I wove with all-linen yarn, I loved it. 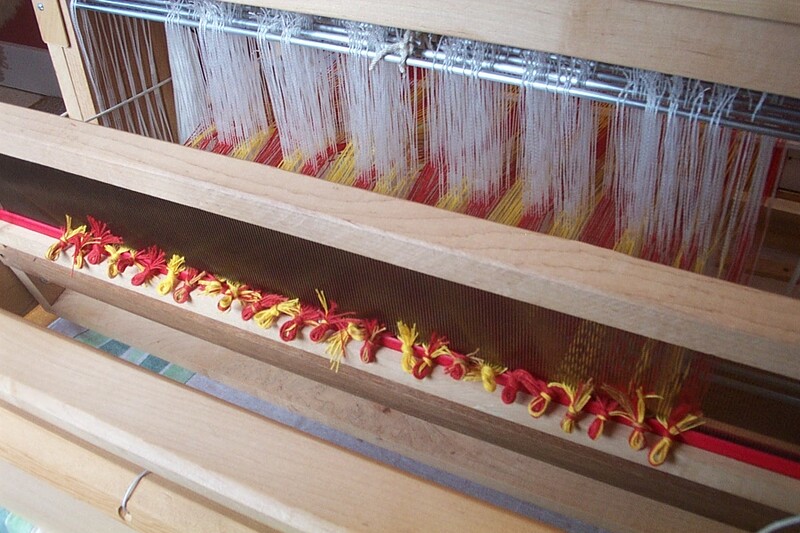 Not many weavers can say they may one day weave with linen as fine as 40/2 and believe themselves. Too, the little bits of different colors are just what I need for rosepath. 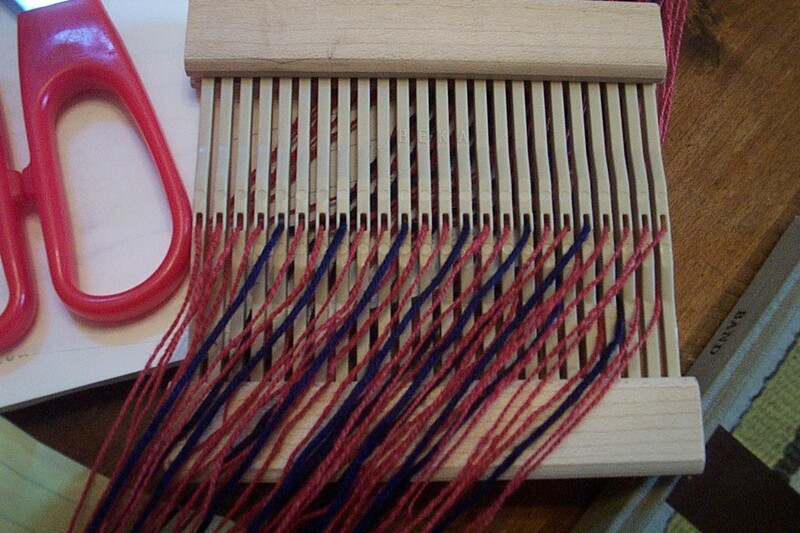 As soon as I realized that I can weave ANY 8-shaft figured rose-path (number of treadles being no object on my table loom), I began wondering how I was going to get hold of a bunch of different colors of linen and cottolin for the pattern weft. Serendipity! Rosepath is a threading I was considering for my Pics to Picks project. Rosepath ground cloth, with a woven net overlay for a trellis, and crewel-embroidered flowers. Yes. It’s insane. The mural towel warp has been sitting like this for a month. I finished warping before we left town for a trip to see my relatives, during which Der Mann got hideously ill. I nursed him for a week, then spent a week staving off the same plague myself. And yet, how can I resist? 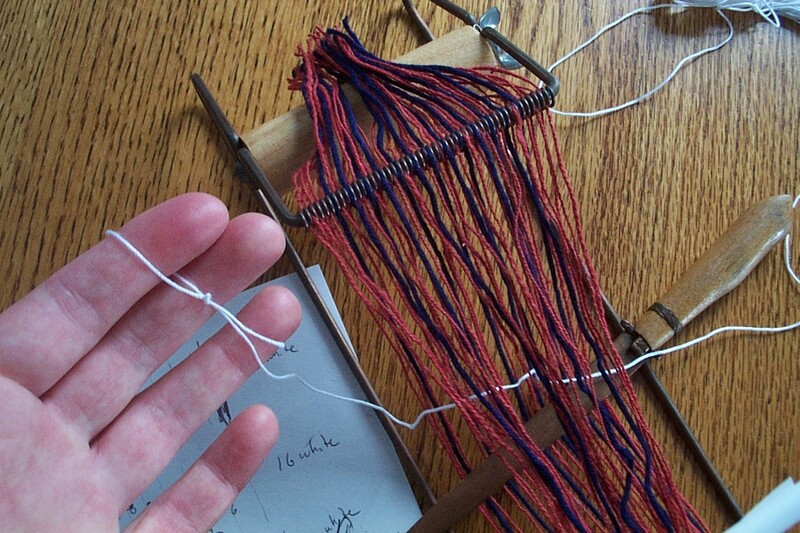 Twenty minutes and I could be weaving my first picks. But there is the garden. We had to re-grade it last year because water was going into the basement, which left us with a 100-percent bare earth yard. I got as many plants in the ground as I could in the fall, and earlier this spring, but it’s a drop in the bucket to what’s ahead. I have supernaturally bad timing for garden tasks. ALWAYS, when I’m ready to work a bed, or set things out, or harden things off (my twelve trays of starts), the rains come or it gets cold. A week ago it was dry enough for us to turn over the cover-crop in the vegetable garden and the two beds that take up the whole front yard, but then the sky opened up again before I could get them raked. 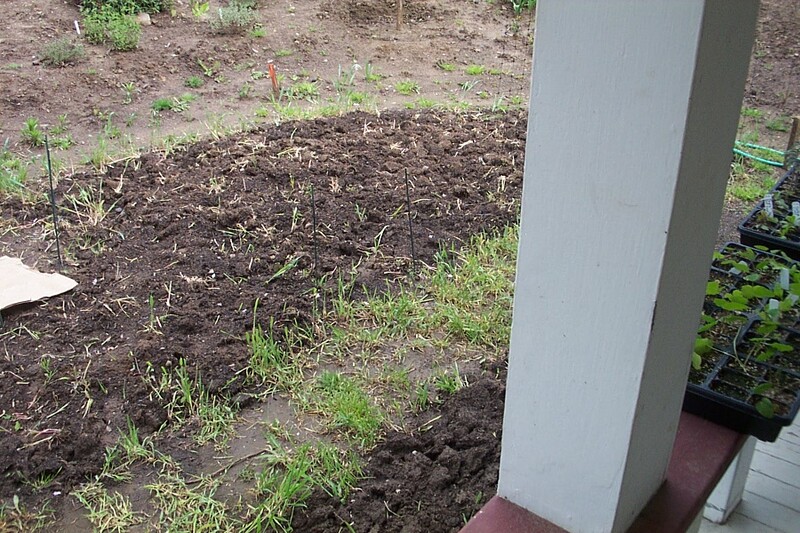 If you try to work clay soil when its wet, you just make a mess which will later turn to hardpan. A “tulip wind” is my mother’s name for the heavy wind that always seems to come right when the tulips are in full bloom, tossing apart the blossoms. 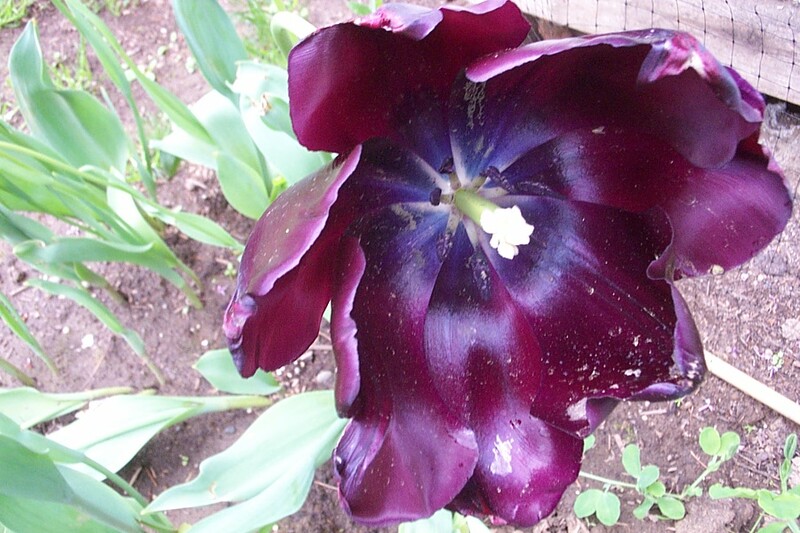 Here it is a “tulip downpour.” I am not a big fan of tulips, but I do have some favorite cultivars I’ve always wanted to plant. Actually, my Queen of Nights put on a decent show before the rain took them down. Really, they were past. 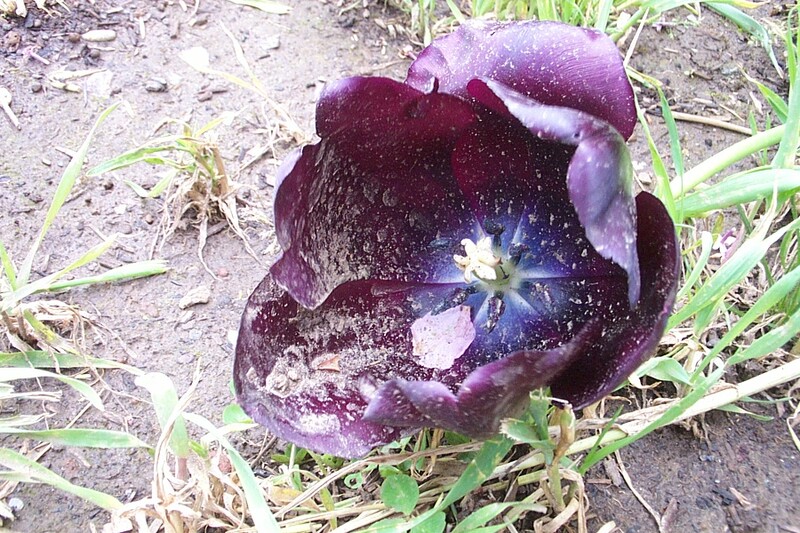 I like them when they fade and open to burgundy almost as much as when they are big, shiny, and purple-black. A metaphor for youth and age? Innocence and experience? The transience of beauty? Okay, so I haven’t been weaving towels because I have been sick-ish, and gardening, but what else? This was another “weft over” from the guild show. 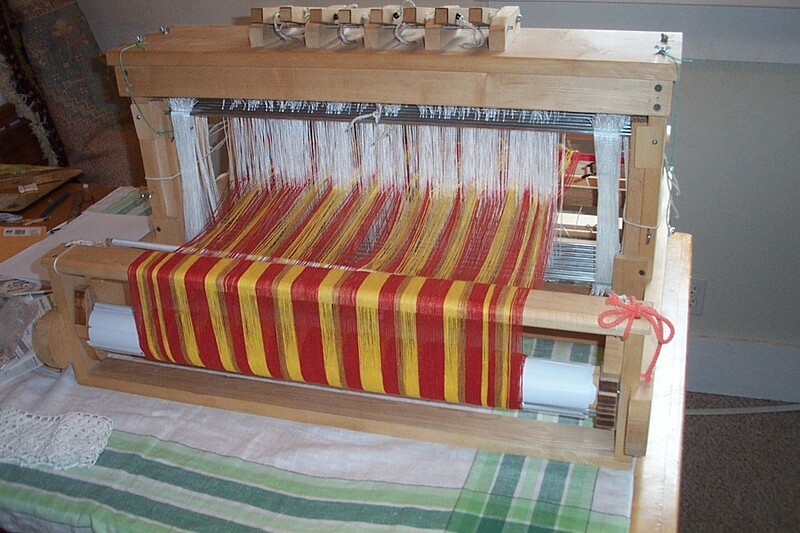 I’ve been shopping for a standing inkle loom. Shopping in the sense of “looking without expecting to find.” They are rare in the states. I don’t like the Le Clerc cendrel much, because it seems more of a warping board with benefits. 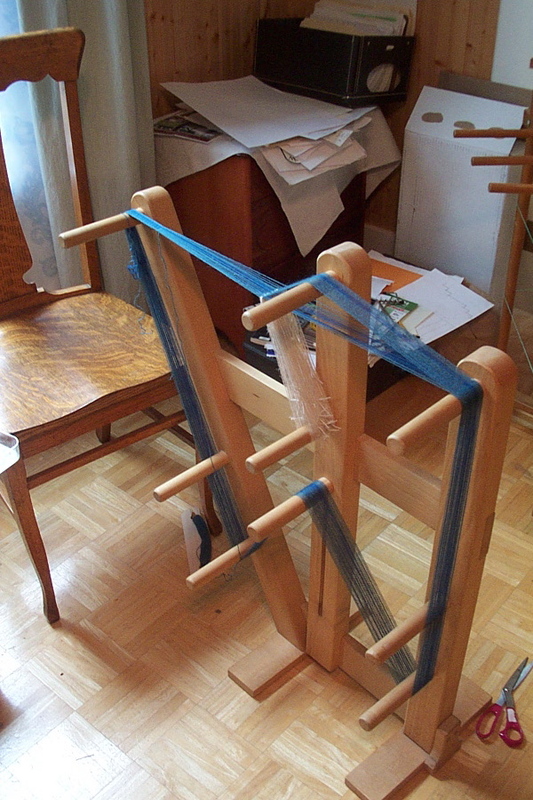 This homemade beast is beautifully solid maple, but I was quite surprised when I got it home and actually worked out the warping plan, that “standing inkle” doesn’t mean “lots-of-warp inkle.” This one has a maximum capacity of two and three-quarter yards. 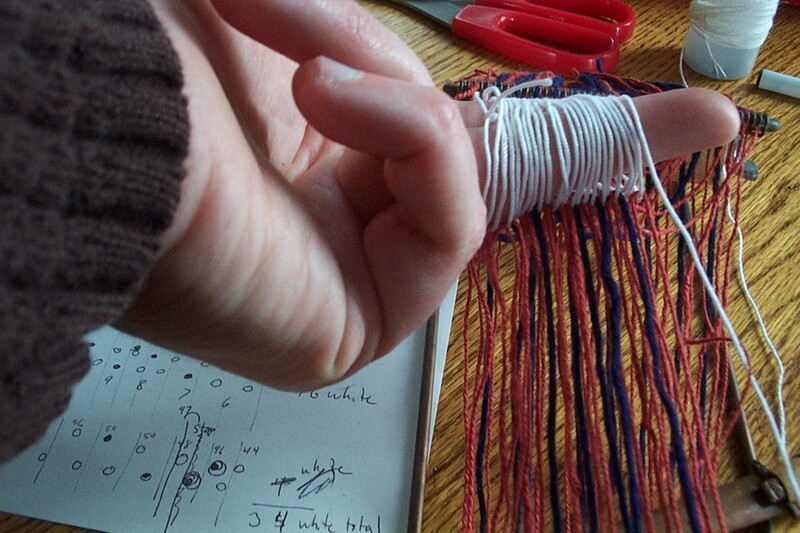 I wouldn’t care, but I would like to weave upholstery gimp and edge trims for curtains. Oh well. The blue wool I’m weaving off now is probably going to be a hat band. 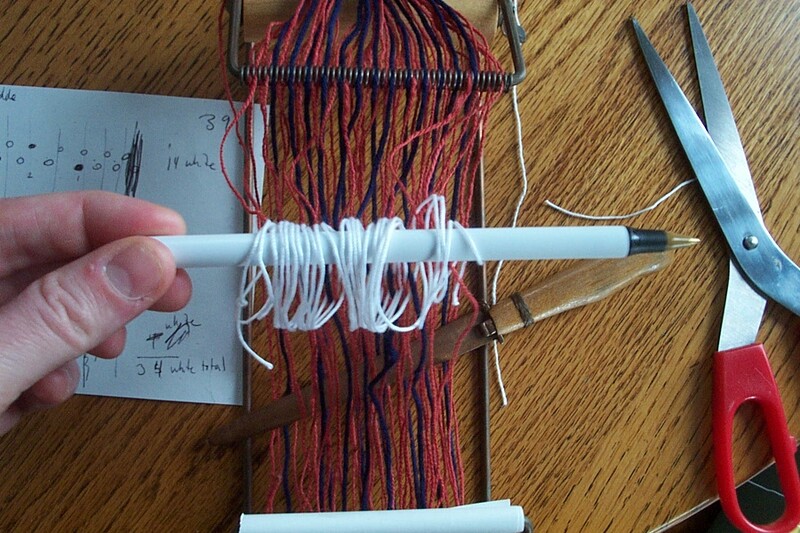 The main reasons I wanted this loom was for a way to tension card weaving and rigid-heddle pick-up bands, but old fashioned inkling, with the leashes, is quite fun. You can just sit down and do it while you wait for the kettle, without worrying about your tension or beat being inconsistent if you hop up and come back to it later. Perhaps you noticed the mess in my messy corner. 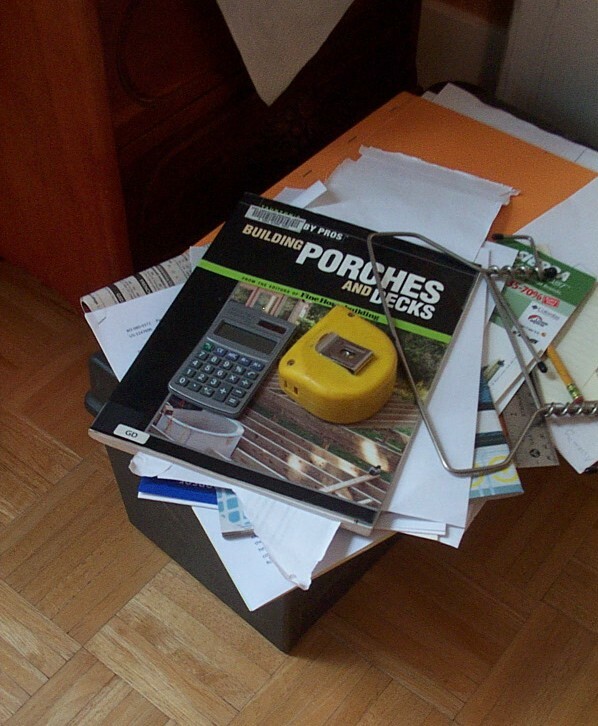 A messy corner (in fact several messy corners) is what I have instead of a writing desk right now. Here’s a close up of the other reason I haven’t been weaving. I am designing a porch for my dad to help us build. To replace the 4 foot drop from our back door. I am also trying to get a plumber to come and do a lot of work that needs to be done before we can build the porch and demolish the moldy walls in the basement. Tradesmen confuse me as much as the weather. I like them. I admire them, especially when they are creative and quick on the uptake. They come as soon as I call them to make an estimate, spending more than an hour going over the work I’d like done. They seem to want to get started. They even ask about my time constraints. They promise quotes . . . . then? If it were clear they no longer wanted the work, I could move ahead with another guy. But it’s this twilit netherworld of obscure signs and signals. My chosen plumber–let’s call him Ryan, because that is his name–spontaneously emails me an apology for not sending the quote earlier, with a promise to send one soon. Surely, he simply wouldn’t have bothered to find my e-mail address and send an email if he had written me off? I e-mail back, cheerily reminding him of deadline, and asking if he can still fit me in. GIVING him an out, if he wants it. Nothing. But then again, a lot of construction guys don’t check e-mail very often. Meanwhile, I am afraid to nag on the phone because I have learned from experience that that will only confuse things. If Ryan doesn’t want the job, my phone calls will simply impel him to keep stringing me along in order to avoid an awkward telephone moment. But if I take his email silence for refusal too soon, and start the whole confused process with another plumber, I’m even less likely to get the work done by the deadline, i.e. when my deck helpers arrive. Boy. That sounds a lot like dating. All that misery I dodged in my teens was only forestalled, it seems. Any romance–I mean plumbing–advice? Anyway, designing porches is hard. I am good at this sort of thing, because I seem to have an infinite patience for it, but so far I have clocked approximately 3 full, nine-hour days of pure thinking and drawing–not counting all the reading I did first, to find out how you actually build a porch, lumber tolerances, that kind of thing. It is a deceptively simple structure. The site constraints are the hard part. It has to be next to the house, but free standing, and I don’t want it to be a rotting, malproportioned heap of crap with no stairs or railing, like the deck we removed before we graded the yard. I am drawing four different board-by-board plans showing the different views. When I finish the last one, today I hope, I will scan the plans and send them to my dad. And he will probably tell me it looks a little strange, and do I really need doubled 2×10 support beams, and couldn’t we just use pre-cut stringers from Home Depot? It’s a weird situation. We are renting the house from my parents, but they want us to fix it up according to our own taste, since we are the ones doing the work and it looks like we will be living in it for a number of years before they sell it. On the other hand, they are footing the repairs bill, and they don’t like to get contractors to do things they can help us do themselves. Hence the need for board-by-board plans, so I can point to them and explain my reasons for every feature I designed, and hopefully still end up with a decent porch, if not the exact one I drew. I am not a good delegator or explainer. Paired with a talent for exhaustive, logical planning, that is a recipe for stress. 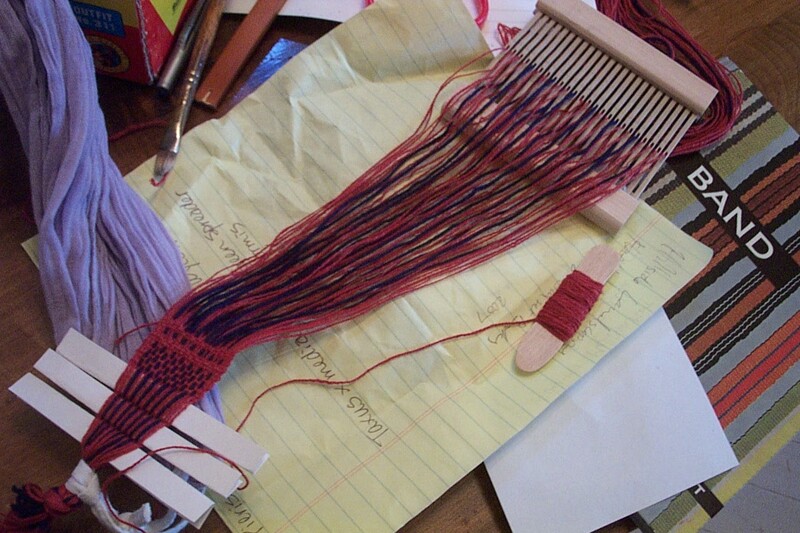 Which is why I like weaving. I can do it by myself. 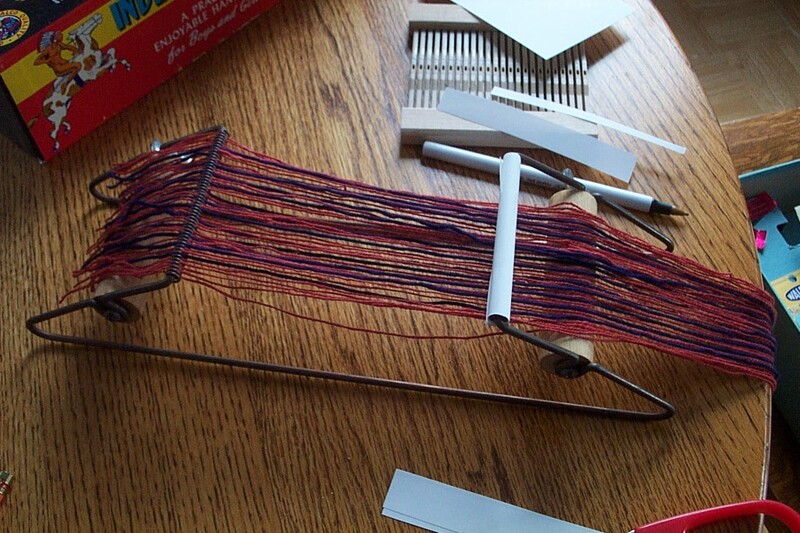 Can you imagine trying to get a loom warped by telling your dad how you want it done? Four days. And then, rightly speaking, it was the cat. “The cat’s on the counter. 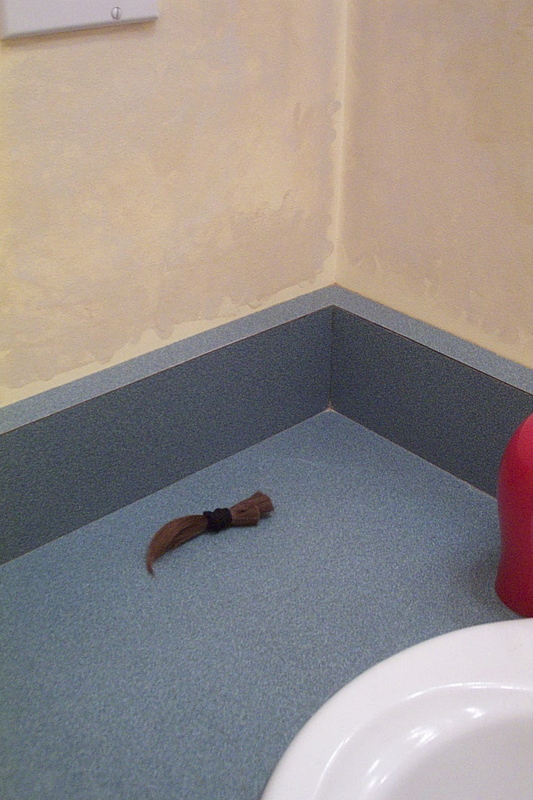 He’s found your hair. He’s freaking out!” said Der Mann. The next morning it was on the living room floor. The cat had been playing with it in the night. The perfect toy: smells and tastes like Trapunto, but can be batted about like prey.